When an emergency code is called over the hospital intercom system, health care personnel spring into action. Any type of injury could be coming through the doors, and staff have to be ready to respond with precision. It’s not just the injury that needs to be considered but also the person suffering from it. Babies and children who come to the trauma bay require specialized care, equipment and medication. To provide the best outcome for these little patients there is no room for error. Walsh spearheads Community Outreach Mobile Education Training (COMET), a simulation-based experience offering community hospitals with acute pediatric emergency training. Simulation is just what it sounds like—a medical scenario presented in real time with medical teams responding and reacting as the situation unfolds. Often medical teams have to travel to large simulation centers to receive this type of training, but Walsh and her staff bring the simulation right into the trauma bays of community emergency departments. This gives teams the opportunity: to include more personnel; to assess their own medical equipment and supplies; and to ensure they are properly prepared for true emergencies. Acute pediatric scenarios can comprise of serious respiratory distress like choking or anaphylaxis, seizures, accidental poisoning or trauma. The team is expanding its menu to include early term labor and birth and complications due to sickle cell disease. COMET uses special high-fidelity computer-assisted mannequins that are able to mimic the physical symptoms of these conditions. Medical teams have to communicate what they are seeing and follow through with a care plan like resuscitating the patient, administering medications and performing life-saving procedures. “After the simulation, we meet as a group to go over what went well and what needed improvement. It is a great way to for teams to see how they can improve communication and where they can make adjustments to improve response time,” says Walsh. Walsh recently received a $50,000 grant from the Childress Institute for Pediatric Trauma—a nonprofit dedicated to promoting innovative ideas in pediatric acute care. The funds will allow the team to build their critical pediatric simulations cases into a pilot online gaming application. The hope is to further broaden the reach of pediatric emergency education specifically for pediatric trauma care. “We are always exploring ways to reach different types of learners. We are excited to build something engaging and educational, something nurses and doctors will want to play on their lunch break. Keeping people fresh, that is what it’s all about,” concludes Walsh. 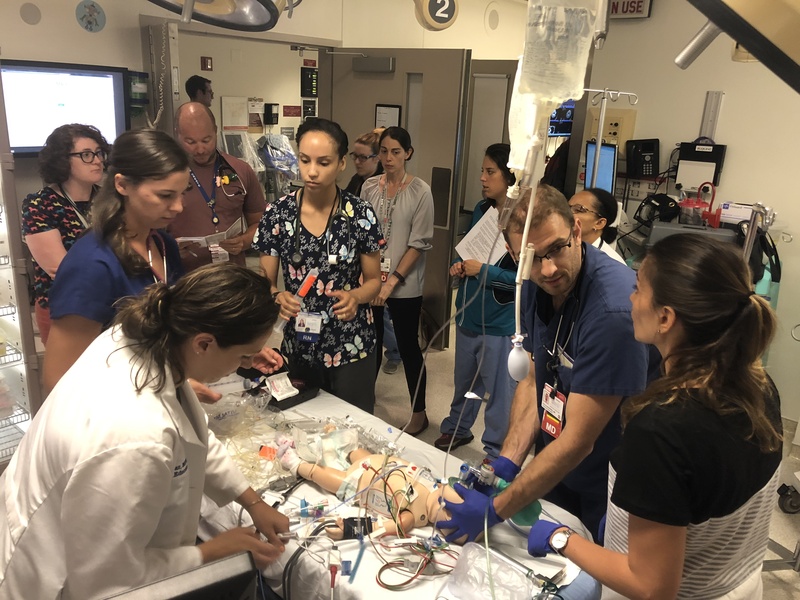 COMET laid the foundation for and is part of a multi-institutional research collaborative called Improving Pediatric Acute Care through Simulation (ImPACTS), which is dedicated to studying advancements in the quality of pediatric emergency care through the use of simulation.